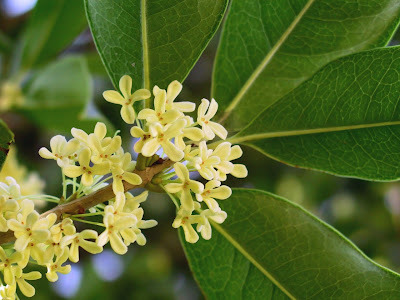 Osmanthus fragrans (Sweet Osmanthus) or 桂花/ guìhuā in Chinese and金木犀/ Kinmokusei in Japanese is another member of the Oleaceae family (like olive or lilac) and its fresh and highly fragrant aroma is a natural wonder professing a nuanced texture. Also known as "Tea Olive" (because olive is the pre-eminent member of the Oleaceae family) it is the emblem flower of Hangzhou, China. It is especially valued as an additive for tea and other beverages in the Far East where usually the aromatic extract comes from the golden yellow flowers variety. This is because the variant Osmanthus fragrans Lour. var thunbergii has more carotenoids in its chemical make-up which contribute both to the sunnier colouring as well as the enhanced aroma. Osmanthus absolute is an expensive raw material for the perfumer, but worth investing in due to its unique olfactory profile: Highly fragrant and succulent in its peachy-apricoty top note it is nothing short of mouthwatering. The effect of the natural flower is undoubtedly enhanced with a synthesized apricoty creamy note (benzylaldehyde, aldehyde C16, amyl butyrate), giving an almost velours effect. The essence of osmanthus naturally contains cis-jasmone (a white floral note), gamma-decalactone and various delta-lactones (peachy-milky notes) as well as several ionones derivates, which accounts for its violet-like sweetness. what a terrific post E - can you steer me in the direction of a non-aldehydic osmanthus ? I don't think I tried many perfumes with prominent Osmanthus note but I do love Ayala's Kinmokusei. And I'm so glad I have a little roll-on bottle of it as it's perfect for this time of year. I only recently dicovered how much I like Osmanthus. Thank you for your comprehensive list! And it is so expensive ! Like a prism, it has so many facets. I like TDC Osmanthus very much, it's quite real-smelling. Lovely! how delightfully you describe that vision of scent wafting...you've transported me. Rush has a peachy-apricoty thing going on, you're right; it might be similar to osmanthus, indeed, though I believe it would be too expensive to produce that effect the natural way and are going synth. how thoughtless of me to forget that one by Ayala! I have added it in the list, it's very nice. ah...you're killing me! Those wonderful flowers and plants in your garden are the stuff of dreams. I'm looking forward to what your enfleurage will yield! darling, thanks for stopping by! How are you? Indeed as you say, it's a gorgeous note, but needs some balanced treatment to be just right. love osmanthus... and doesn't un amour de patou (i think this was jean michel duriez's first for patou) rest on osmanthus? will have to look into several on your list... and revisit datura noir. good thinking! I need to add it, I guess. Thanks!! Elena, thanks for the recommendation - I'm adding it to my must-smell list! most welcome. And you know what you should do next, right? Report back! I am dying to know if it's true that it takes 1000 osmanthus blossoms to make a bottle of Jean Patou's perfume 1000. And do the flowers have a brief flowering time?? what a joy it must have been! Thanks for sharing. I don't know whether they bloom all too quickly. Depends on how one defines quickly, does it not? MMMmmmmm Osmanthus! LOVE! My osmanthus bush is blooming right now. Delicious!